It is sometime later back in England that we see Porter in a job as a security guard he finds totally unsatisfying and demeaning to his skill level. His old colleague Collinson, however, goes on to become the head of section 20 with Mi6. When a female journalist, Katie Dartmouth (played by Orla Brady) is kidnapped in Iraq, Porter is re-activated. The two characters of Porter and Collinson come together again to mount a rescue mission. This is Porters chance for redemption and the opportunity to again ply the skills he gained as an SAS soldier. As Porter battles to recue Dartmouth, new information emerges about the 2003 mission in Basra, information that casts a new light on the events of 2003 and the relationship between Porter and Collinson. In the third episode, Porter is sent to Zimbabwe under the cover of a black market diamond dealer in the attempt to rescue former SAS soldier, Felix Masaku. Masaku has tried to assassinate Robert Mugabe but really only assassinates a Mugabe double. Porter is arrested for his diamond dealing and finds himself in a prison with Masuku. After a one on one fight with a prison inmate set up by a prison guard, Porter assists Masuku to break out of the prison. However, there are still more twists in the story that add to the enigmatic relationship between Porter and Collinson. In these three stand-alone stories set in Iraq and Zimbabwe, the narratives combine to highlight the intertwining of politics of war and the personal lives of two very motivated ex SAS soldires, Porter and Collinson. The scenes range from fire fights in Iraq to a one on one combat in a Zimbabwean prison showing such diverse landscapes as the desert landscapes of Iraq and the greenery of the Zimbabwean outback. 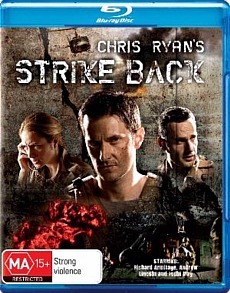 ‘Strike Back’ takes us in to the mind of the professional soldier. It has high energy and intrigue as well as exotic locations. However, with all these ingredients it still seems to be lacking in substance. As a television mini-series it comes up trumps as there is something in each episode to draw the viewer in to the next instalment. The acting is good and the script good enough yet I was left feeling unconvinced. Maybe it was just a bit too contrived for this particular viewer.